Welcome to the first write up of an interview with a photographer. Every once and a while I choose a photographer who I have worked with to do an interview. These are photographers who have proven to me time and time again that they are reliable, professional, and of the highest quality. Unless specified otherwise, these are all Northern Colorado based photographers. I highly recommend each and every one of these individuals. If you are looking to update your portfolio and want to spend your money on someone who will guarantee you amazing images, this is the blog post you want to read. TONY ROCCO/TONY CLAPP: Brand name depends what you are booking for. I worked with Tony a lot over the winter on multiple projects, including a bridal shoot all the way up in Vail (September). His shots are clean and crisp, and I like that he likes to practice concepts before doing the real deal with paying clients. He used to do group shoots to practice- he now has a “brand ambassador” program that runs for a few months at a time with multiple models. 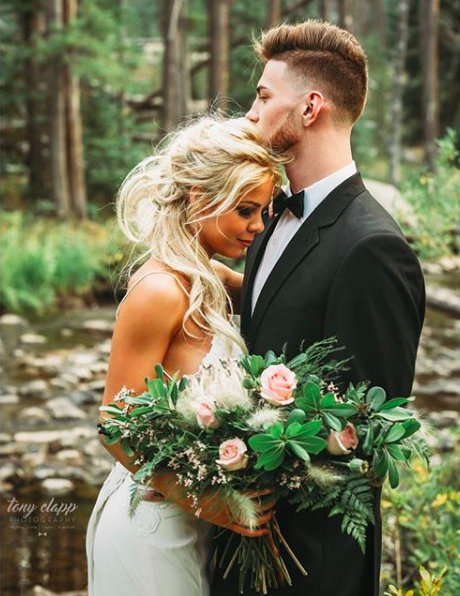 Favorite shoot I’ve done with him: Probably the bridal shoot up in Vail. Favorite moment off camera: Tony gives great life talks and can give you a confidence boost if you need it. ASH: Hey Tony! If you had to choose, what would be your absolute favorite style to shoot? TONY: I like to shoot all styles that make the subject feel empowered and awesome. I've been shooting more fitness and glam this year. I love bridal portraits. ASH: Real quick, outline your two different brands: Tony Rocco and Tony Clapp. TONY: Tony Rocco is glam, boudoir, and fitness, and Tony Clapp is weddings, family, and seniors. ASH: Alright, Tony. What is an interesting fact that people may not know about you, outside of photography? TONY: I'm a practicing lawyer and owner of the studio (RAW) and photo companies. ASH: Do you prefer shooting studio lighting or natural lighting? TONY: I like both. I like the drama of studio, and I like the pureness of natural light. ASH: What is the best piece of advice that you could give to an aspiring model (from a photographer's perspective)? TONY: Know what you want to shoot and why. Don't tell a photographer that you'll shoot anything. Shoot with a purpose in mind. Don't shoot with photographers (on a trade basis) that can't help your brand. Pay for good work- it will get you to your goal faster. Take it seriously. ASH: Switching gears here. How much should an aspiring model expect to pay for a basic shoot? TONY: $200 for the session fee, plus edits, for 2 hours of studio time including hair and makeup time. $500 is a good price for a good package with good edits. A model should expect edits in five days, maximum, but it depends on the number of shots. ASH: It's different for weddings though, right? Since there are more images? TONY: 700 images. Building a wedding album is really time consuming. Edits are different for a wedding. Not as much skin work, etc. ASH: How cheap would you say is too cheap of a rate for a photographer where a model may want to be skeptical of the work they are going to get? TONY: $350 is the low end with 4 edits, for a good photographer. ASH: What about images that someone wants published in a magazine? Someone comes to you and wants images that they can submit for, say, a glamour magazine? What should they expect to pay? TONY: $1000 and up. Hair and makeup, a full styling team, and high end retouching with a three hour shoot. ASH: Whoo! Oh man, guys. Buckle up. Make sure that you pick the right photographer and pay for all of the things so you don't have your submissions turned down due to poor styling. TONY: Yup, and publishing in a credible source is very helpful (for reaching goals). ASH: Okay. A model comes to you and says "I just want to build my portfolio." That's all they say. What is your first response? TONY: I ask three questions. Who is going to pay you? What are they going to pay you for? And how are you going to find these people? ASH: Tony, what other advice do you have for people who have no idea what they want to do and are up in the air about modeling? They just want to "pose for photos." TONY: The worst thing you can do is just go and shoot with anybody who has a camera. ASH: What if they don't want to pay for photographers? And what if they literally cannot afford it due to being in college, or something like that? TONY: You need to figure out a way to afford it. Build good habits. Learn lighting, posing, styling. ASH: Oh! Let's flip this. This wasn't on your questionnaire. What would you tell photographers about booking models to build their photography portfolio? ASH: Yay! Haha, thank you, Tony! TONY: Hire someone who takes it seriously. It's a job. Posing is good. Expression is better. Learn what a good image looks like. There is so much crap out there. ASH: Where would you recommend looking for inspiring photos? What might you search? TONY: I use Pinterest or Google for inspiration. A good image should have proper lighting, wardrobe, and expression. Find a photographer who you like and watch their work. Good work focuses on the subject. ASH: Alright, I have one last question before I'll ask you talk about your photography business. What is your worst fear during a shoot? TONY: I don't really have fears during the shoot. I worry more about preplanning, and things like weather change on a location shoot. Having all the right equipment. I am always afraid that I'll forget a memory card. ASH: Now you get to talk about your brand ambassador program! I did this a while ago. TONY: I choose five people as brand ambassadors for a three month period. They get two shoots a month and get to shoot their own concepts. In exchange, they post and put out promotional stuff. People can submit July 1st for the next round that starts October 1st. Just DM me for information. Guys should apply too. Thank you all for tuning into the live chat! Next week we are back to normal, and will have another photographer interview next month!